Maybe not so visible in the pic is the fact that is was raining - ney, pouring - for most of the day. I don't think I've ever seen so many umbrellas in one place. Speaking of umbrellas, in Tokyo, whenever you end up inside a shop or a department store somebody will press a plastic sleeve on you to pack your umbrella in, so you won't be dropping water on their floors. Maybe a sensible precaution, but not exactly environmently friendly. Not really happy about all that plastic trash. Yodobashi got quite a bit of my money, as I not only got the lens, but also, finally, I've joined the world of the iPod users. I nice, nifty, iPod classic with 80GB. I, naturally, wanted to hook it up to iTunes, I only got the Japanese instructions - and even with my many visits here, I've never managed to master that language. Before going to Yodobashi, I've been in Ginza. Not very likely I buy much there, as Ginza is known mostly for beautiful and *very* expensive things. Hermes, Louis Vuitton, Gucci, you name it. Definitely outside of my normal price range. A hand bag for a measely 1000 Euro, yeah, right, sure. One thing, though that's affordable in Ginza is the food. Think of it sort of a cross of any food court you've ever been and the one in Harrods in London. Good, sometime sheer unbelievable food, all to take out. So, usually, when I end up in Ginza, I grap a few different things, and eat it in the roof garden basically all deparment stores have. Only, I think I mentioned it before, it was raining, and the roof garden had no dry spot. So I found a barely used staircase and ate my fried dumplings there. 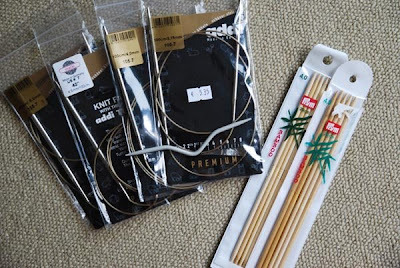 There was one stop I had to make in Tokyo, though, and that was the yarn store I've discovered the last time I was here: Okadaya. I love that place, so much really nice yarn and the prices are reasonable. 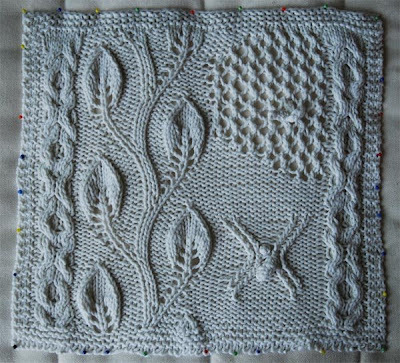 I've got more of the same 2ply yarn I've grabbed up last time (and made into the Branching Out Scarve and the Snowdrop Shawl) I've got the perfect pattern for it in Victorian Lace Today and it should be plenty enough for it. Well, after a lot of shopping and getting wet, I've got my bags (not everything fitted into the backpack as I've hoped it would) and headed back to the hotel. Two more days and then home on Wednesday. This second project is the kid silk haze scarf I've started last time I was in Japan (remember this phote here?) Of course, I've ribbed it up once (or basically restarted it as the Rowan is very rib resistant ...), so the look has changed a bit in the mean time. As I'm going to Japan on tomorrow, I've decided to take something more light weight than the afghan, though this doesn't mean I didn't knit on it last week. 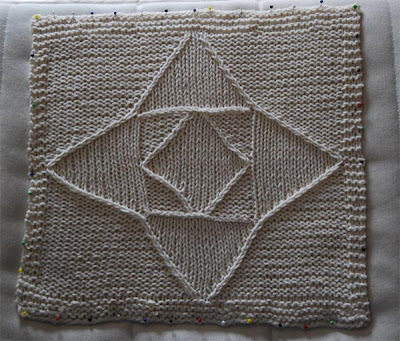 I finished three squares. Block 11: GAA no. 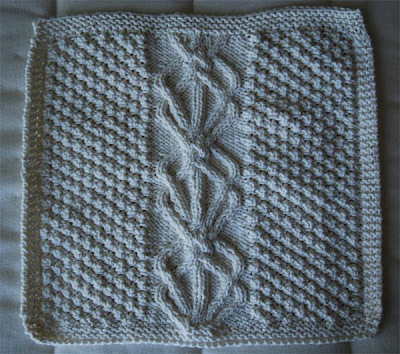 19 Barbara Venishnick - the entrelac part was fun, but the two bits left and right just didn’t work out the way I wanted. I thought it’s a smart move to, instead of knitting them up and then sewing them to the main body, I would attach them to the center bit as I was working my way up. I ribbed both sides up at least one and still not happy with the left hand side. More squares and a new start. Block 10 (080614): GAAA no. 2 Julie H. Levy - not a very exiting square, but not boring either. Monday in a week, I'm going to Japan once again. For the knitting on the plane I've picked another pattern from Knitty (Spring 2008). It's the Lace Ribbon Scarve. 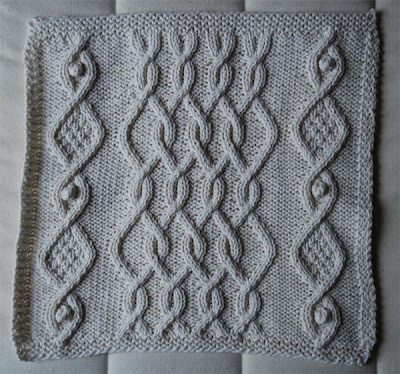 I did two repeats so far, and I'm confident that it will keep me busy for a while. 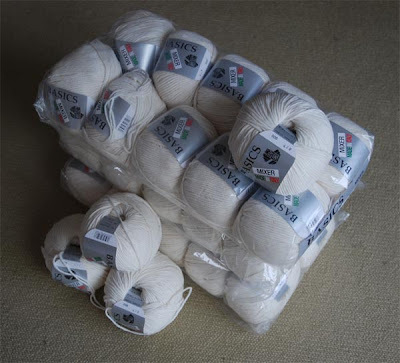 The yarn is one I've picked up last December in Japan (so I'm taking it home, really). 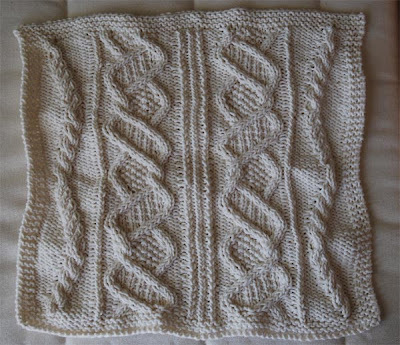 Very fine yarn, very soft, no idea what it's made of. 15 gramms run for 148m - that's quire a bit. I've got five balls, which should be plenty (the pattern asks for around 600m, though I'm making one more repeat of the pattern, as I'm knitting it on smaller needles). 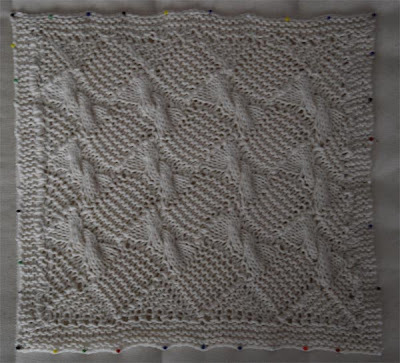 The pattern is easy to memorize, but does require some attention, so you don't drop stitches. 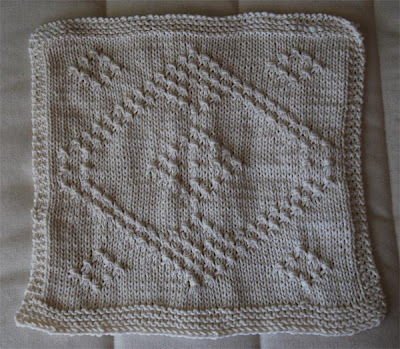 I'm on a roll - means I'm going to show of nothing but afghan squares for a while. Block 6: GAAA no. 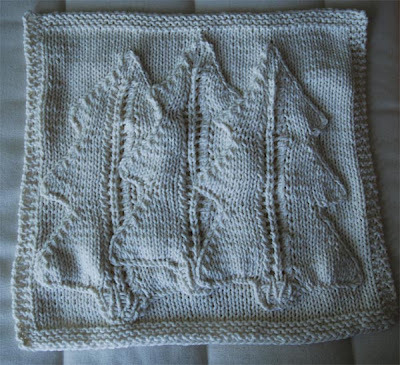 4 (Meredith K. Morinka) - this was originally my test swatch to decide which yarn to use. It is too long, so I took out one repeat. 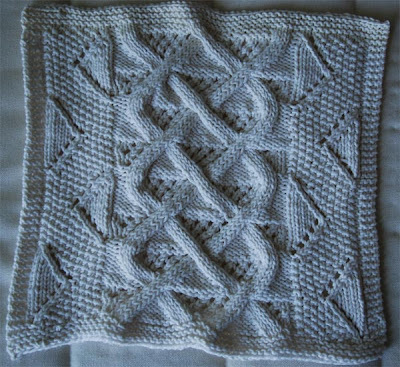 I'm on a roll - means I'm going to show of nothing but afghans squares for a while. 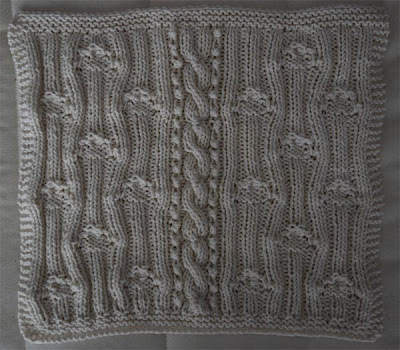 I plan on making the Great American (Aran) Afghan. I've got 36 skeins of the yarn, I have to see how far I get. 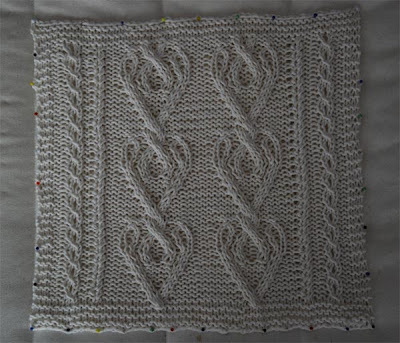 As I plan this as a bed spread, I will certainly need more than the material for the 'normal' afghan. 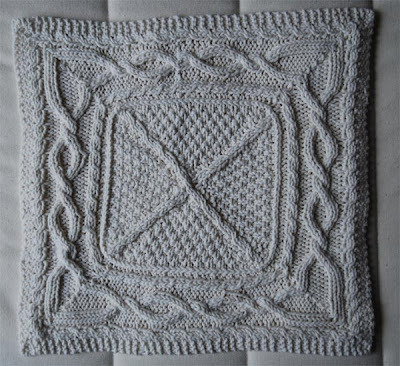 I also will use pattern from both books (Great American Afghan and Great American Aran Afghan), whatever I'm in the mood for. Just one quick finish from last weekend to add. Finally got around finishing them. No idea what took so long. Pattern is my own, toe up with magic loop, short row heel and some funky bind off.